"WIN! 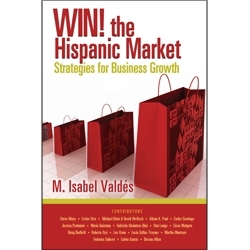 the Hispanic Market by M. Isabel Valdes"
Every businessperson, from the boardroom to the mom-and-pop retailer, knows that without customer growth, there is little hope of business growth. In the United States today, the most growth is coming from customers of Hispanic origin and projections are that the trend will continue. Hispanics are younger, have more children, and are still forming new households. Corporations that “right-size” the growth opportunity and invest appropriately when it comes to their Hispanic customers increase their shareholder value and have continued success in the marketplace. The top experts who contributed to this book demonstrate how to do it right. Gabriela Alcántara-Diaz, President/Strategist , GADMarketingCommunications, Inc.
WHY and HOW to use social media, and why you may have to rethink your distribution channels if you are serious about finding your missing customers.